2009 has barely begun and we've already got some interesting items for this year's auction. 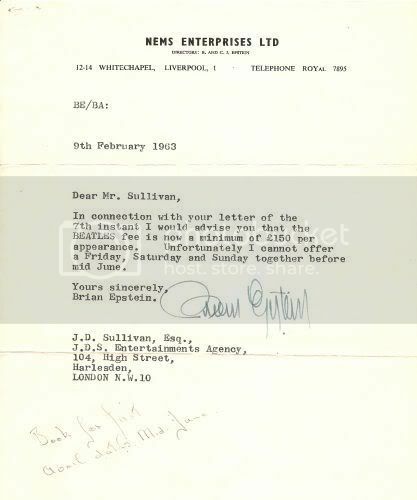 These four letters from NEMS Enterprises to the JDS Entertainments Agency in Harlesden, London will be of interest to collectors who are into their Beatles History. 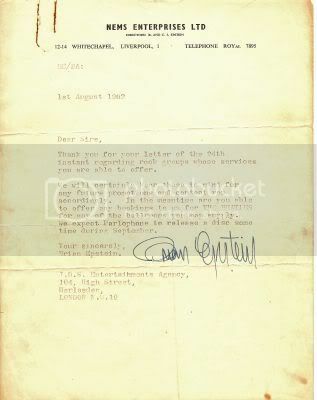 The first letter is dated 1st August 1962, and in it Brian Epstein ends by asking if there is any offers of bookings for The Beatles at venues the agency may supply. 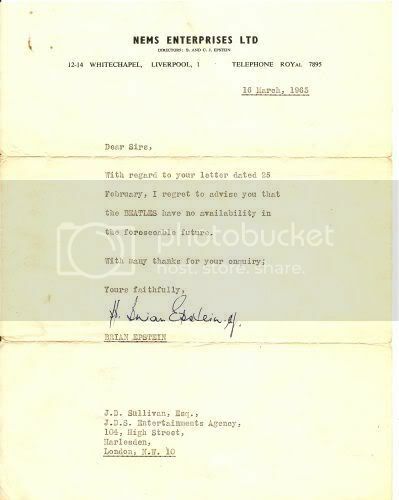 By the date of the fourth letter on 16th March 1963, only seven months later, the agency are being told that The Beatles "have no availability in the foreseeable future." In those few months, lots had happened. Pete Best was dismissed on 16 August. Ringo made his live debut with The Beatles on 18th August. John Lennon married Cynthia Powell on 23rd August. Their debut single was recorded at EMI during September 1962 and released on 5th October. 17th October saw their TV debut on Granada's People and Places. In December 1962 they made their final 13 nights run at the Star Club in Hamburg. On 11th February they recorded their debut album in a single day. 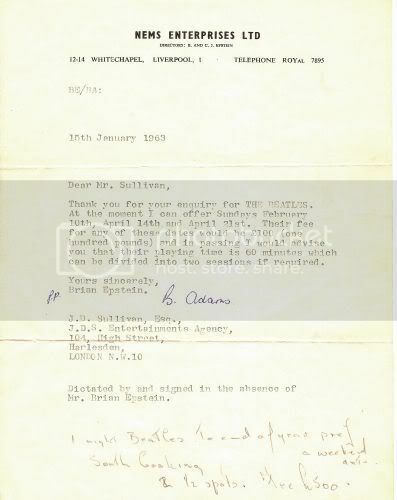 Two of the letters are hand signed by Brian Epstein and two are signed on his behalf by secretaries. Stephen Bailey, manager of The Beatles Shop on Mathew Street who organise the annual Beatles Auction every year, thinks the letters are fascinating. "It's interesting to see the transition from being open to offers for the band to play to them becoming unavailable in the foreseeable future. Such a lot happened to The Beatles in that short time between, and the letters are like before and after snapshots of that."